Legspin bowling: Leg Spin Bowling - Bowling Drills, Training, Practice & Visualisation. Leg Spin Bowling - Bowling Drills, Training, Practice & Visualisation. With spin-bowling especially wrist spinning (Adil Rashid link) there’s a good chance that when you’re learning you’re going to get smashed to all quarters of the ground by tail-enders, middle order players and openers at some point. To some extent this sorts the wheat from the chaff, only those that are tough enough mentally are going to survive such encounters and be able to pick themselves up and turn up for the next game and give it another go. Adil Rashid being a perfect example of the mental toughness required to be a Wrist Spinner. But, what you don’t need as a spin bowler is the same crap when you’re practicing. Clarrie Grimmett famously practiced in isolation, having a net in his back yard where he practiced all of the time. He never practiced in the nets against batsmen in the Aussie team because he knew that he’d meet them again in domestic games in the Sheffield shield matches and he didn’t want them to have any idea about how they might approach his bowling. He was also aware that there was very little to be gained bowling in the nets because batsmen never batted in the way that they’d bowl in a game and therefore saw it as a pointless exercise. I too completely agree with Grimmett and have very little time for bowling in nets as I recognise the same issues and find it a pointless and soul destroying exercise, especially if you do it without any specific intention or outcome. A spin bowler needs to have a bag of balls or at least a fence behind the stumps. I used to have 24 balls and would bowl 24 from one end then collect them up and bowl from that end for hours on end. Over the years I’ve developed different ways of doing it, but believe it’s essential to have several balls so that you can bowl in overs. Six balls would be a minimum if you’re bowling in nets as the collection of the balls kind of replicates the break between the over at the other end and yours. 2 Player method (Bowler and batsman). should be given for wicket taking. 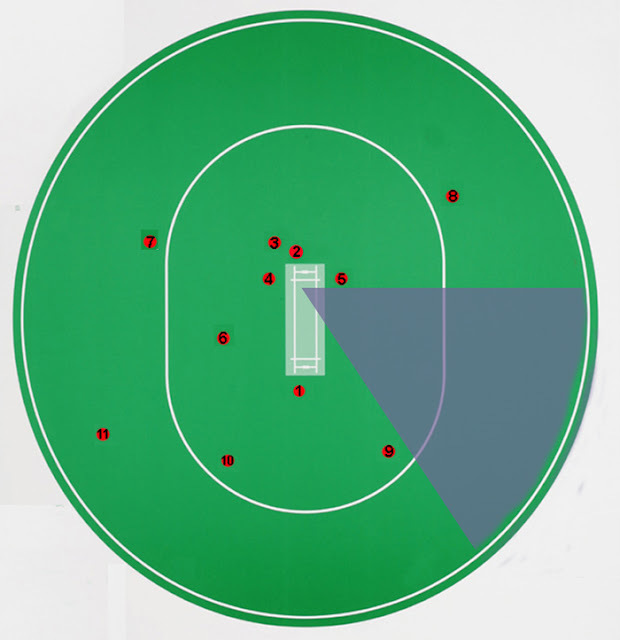 This field for instance may be set for a batsman that's been seen in the first over as struggling to play the ball being bowled coming round the wicket (Right - arm Leg Break). Warne advocates in the first over, extending potentially into the 2nd over that you bowl from different positions on the crease in order to ascertain the strengths and weaknesses of the batsman's approach.